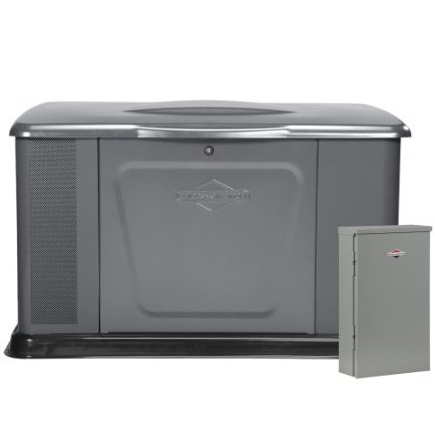 This Briggs and Stratton 40396 standby generator system can be placed on the outside of your home as close as 18 inches. It has a unique front airflow ventilation technology that pushes the engine exhaust away from the home. It is ideal for large homes and can power up to two air conditioning units. A polymer installation pad comes with the generator. This product costs about $5,800 online at Amazon. It has a noise level of 68dba and comes with a 4 year limited warranty for consumers. A battery charger is included, but you will need to purchase the battery separately. It comes with a transfer switch as well. The main feature is the hour meter where you can tell when maintenance is needed. An additional feature is the automatic low oil shut down that helps protect the life of the engine. This product is recommended for its quick response and multiple features. It uses two gallons per hour at 50 percent load.